First there is no preset height for fast horizontal movement. You can move at full speed both at high or low level, and the way the chair is designed does not make one height appear better than the other. You can do what you want. Secondly, you have separate controls for elevation and horizontal movement; this means that you can go up at the same time as you are going forward. It also makes your life easier in a smaller way - you do not need to change your controls from forward movement to elevation. Although it might be just one click, if you have to do it again and again it can get annoying. 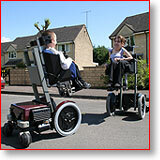 In a dragonmobility powerchair you have access to all controls all the time!